For 1-1/2 in. Polytape Installed On Wood Or T-Posts. All Metal Parts Are Of #300 Series Stainless Steel. Dimension - 8 x 4.75 x 1.5 in. Insulators Are Molded Of White High Density Polyethylene With UV Inhibitors. Each Assembly Includes An Electrical Connector Consisting Of 1 Self Tapping Lag Screw & 1 Wire Terminal. Use To Connect To Energizer Or Jumper As Well For Your Electric Fencing. Dimension - 3.5 x 1.25 x 6.5 in. High Strain Corner & End Insulator. Suitable For High Tensile Fence. Dimension - 1.5 x 6 x 8 in. Tubular Wrap Around Corner & End Post Insulator. Metal Insert For High Tensile Strain. Molded Of Polyethylene With Carbon Black To With Stand The Elements. Dimension - 1 x 4.5 x 12 in. Corner tensioner for 11/2 inch polytape. Use To Replace Most Dare Fuses In Dare Fencers. Dimension - 0.25 x 3.25 x 5.25 in. Dimension - 4.5 x 0.25 x 1 in. Size - 5/16 x 48 in. Dimension - 47.8 x 3.5 x 0.4 in. 1 joule output electric fence energizer. Controls up to 100 acres overgrown fence outperforms 25 mile energizers. All weather construction for longer life. Peak joule output under the most difficult electric fence conditions. Dimension - 5 x 8.5 x 10.75 in. 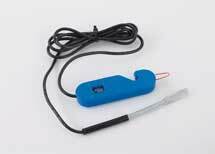 Enforcer series electric fence energizer. 110v plug in ultra low & low impedance. Controls up to 5 acres of weed free fence pulsating low impedance. More powerful than many 6 to 12 volt solar models. Controls horses dogs & small garden animals. Dimension - 7.25 x 2.75 x 5.5 in. 0.5 joule output electric fence energizer. Controls up to 50 acres overgrown fence outperforms 10 mile energizers. 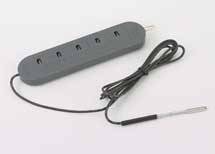 Dare Products DE GK 20 Garden Electric Fence Kit 31 x 8 x 3.5 in. Raccoons pets & other animals out of flower & vegetable gardens. Quick & easy installation for a 100 ft. 2 strand fence. Dimension - 31 x 8 x 3.5 in. 0.07 output electric fence energizer. Controls 1-3 acres of clean fence. For use when an electrical power source battery self contained. Dimension - 10 x 8.5 x 10.5 in. 3 joule output electric fence energizer. Controls up to 300 acres overgrown fence outperforms 75 mile energizers. Peak joule output under the most difficult fence conditions. 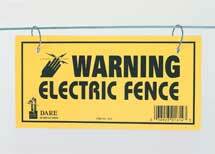 Sentry series electric fence energizer. 6v to 12v battery model low impedance. Controls up to 25 acres of clean weed free fence. Outperforms energizers rated for 10 miles controls cattle cows horses pigs dogs & small garden animals. Dimension - 5 x 8.5 x 10.5 in.